Notwithstanding the long-running claim that most restaurants fail and are foreclosed on, the reality is that failing restaurants usually are sold by professional commercial real estate firms such as Bielat Santore & Company, Allenhurst, New Jersey before they ever get to that stage. Over its 35 years in business, Bielat Santore & Company has sold hundreds of restaurants. The majority have been operating and successful, some have been operating and unsuccessful and a limited number have been closed down and bank owned. This story is about the latter. Bielat Santore & Company was hired by Republic Bank to dispose of a closed restaurant in Waretown, Ocean County, New Jersey. The subject restaurant included land, building and a liquor license. The bank had foreclosed on the real estate and thus the property became bank owned. Because the Philadelphia headquartered bank had no experience with liquor licenses in New Jersey and did not want to take possession of that asset, Republic Bank had Bielat Santore & Company appointed as a “court receiver” to sell the license. A receiver’s main function is to liquidate the available asset(s) and ensure as much debt as possible is paid back to creditors. Although selling a closed restaurant in the post “Superstorm Sandy” depressed region of Ocean County was a difficult task, and probably took longer than both Republic Bank and Bielat Santore & Company had first anticipated, a buyer was found. But that was only the beginning; now the work began. How do you secure financing for a start-up business to purchase and renovate a restaurant property that had failed in business and had been closed for nearly two years? Not easy; but accomplished by Bielat Santore & Company, who, while in business, has secured in excess of $500,000,000 in financing to facilitate restaurant related transactions. The transaction closed on October 31, 2017 as reported by Richard R. Santore of Bielat Santore & Company, Allenhurst, New Jersey the broker for the sale. 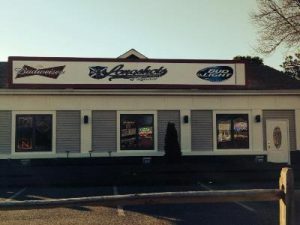 Following an estimated 4-6 weeks of renovations, Breakers Kitchen & Tap will open its doors at 535 Highway 9, Waretown, New Jersey. Breakers Kitchen & Tap will take advantage of the popularity of gourmet bar food, fresh local seafood, and craft beer. The concept will also incorporate televised sporting events, a focus on friendly and professional service and a concentration on supporting the community.